You can create custom content that will display on the Resources tab of a sharing portal. For example, you can provide instructions, examples, downloads, links to other pages, or other light customization. From the environment you want to share, click the Sharing Portals tab. A list of sharing portals displays. Click the sharing portal you want to change. The Sharing Portal Options page displays. Under Portal Customization, click Enable custom content tab. If you want the sharing portal to open to this tab by default, click Make this tab the default landing page for this portal. To customize the tab name, select Custom title and enter the name of the tab as you want it to appear in the sharing portal page. The tab name is limited to 32 characters. If you don’t provide a tab name, the default value: Resources is used. Enter your custom HTML Content. For examples, see Examples for custom HTML content. 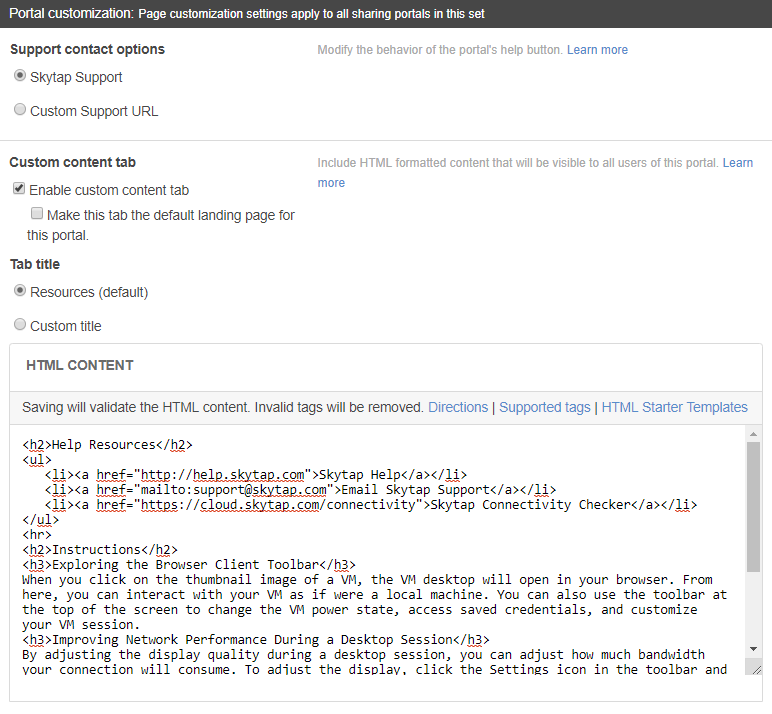 Skytap limits the HTML tags and attributes you can use (see Allowed HTML in custom content). Unsupported HTML tags are removed when you save your custom content. HTML text must be less than 32kB. Each sharing portal can have its own custom content.